I don’t think we hear enough about Frances Bissell. She is is such a fabulous food writer who the writes from heart with a wealth of experience and I feel rather miffed that I didn’t follow her when she used to write for The Times, who unceremoniously sacked her in 2000 by email, after writing for them for 13 years. She no longer reflected the needs of the readership apparently. Good old Mr Murdoch. Maybe she didn’t have enough pictures of cupcakes? 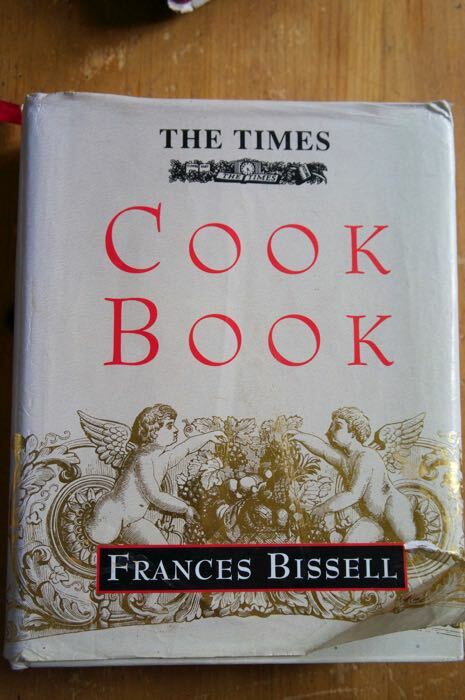 Like me, Frances Bissell likes a cookery book to be able to stand on its own two feet without the need for endless pretty pictures. I have nothing against photographs, I adore food photography and it is something I am striving to improve upon at the moment but I am not a fan of the hoards of cookery books that consist of pages of just recipes accompanied by a huge photo of a pimped finished dish with a well placed prop or two. Beautifully styled they may be, but I find them rather soulless without any passion for the food, just a recipe with a picture, nice to look at but that’s about as deep as it gets. I like a cookery book that tells some sort of story, whether in historical, biographical or geographic terms and this book has it all. Full of advice, stories and anecdotes of Frances’ cooking journey and indeed journeys, with recipes from all around the world as well as the very basic recipes that all good cooks should have under their belt. There’s not much that’s not in here, it is a fabulous book for both novice and more seasoned cooks. This is the book which taught me to always add a drop of port to my Shepherd’s Pie, such a small thing but it makes the world of a difference. Her recipes are inspirational and sometimes I even take the book to bed with me just for a good read, I never tire of her writing, she is so informative and deserves to be more well known than she is. I haven’t seen her new book yet, The Floral Baker: Cakes, Pastries and Breads, but if Father Christmas is reading this I’m sure it could squeeze it down the chimney, I might even leave you an extra mince pie! Maybe I feel akin to her because, like me, she doesn’t have a television (at the last time I read about her) and she also has a cast iron skillet used just for pancakes. Although as at the moment I am eating rather too many pancakes, a television might be a good idea, at least it would get me out of the kitchen.